We couldn’t agree more. To add to the composition’s largesse, watch below as Watson and ensemble give a great live reading of it at the recent CBC Music Festival. Watson’s vocals (together with his backers’) are superb as usual. There will be joy! Watson is currently out on tour and though his Hollywood Forever Cemetery show on June 4th is sold out, there are lots of options to be found HERE. And ferheavensake go buy the great new album HERE. 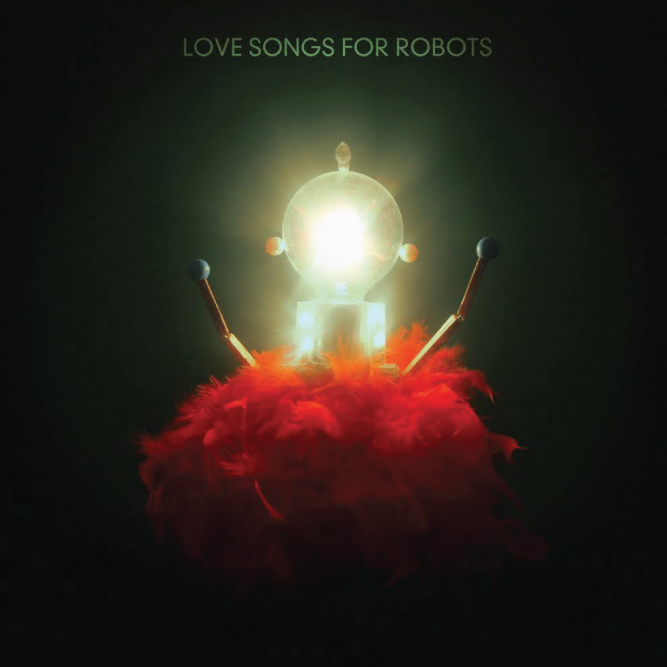 And if that wasn’t enough to convince you to go see Watson and buy Love Songs for Robots, then watch below their Arcade Fire-ish performance at the Fairmount Theater in Montreal of another superb track off the album, Hearts. Wow. Courtney Barnett continues to take the world by storm with her new album Sometimes I Sit and Think, And Sometimes I Just Sit, with its wise-hearted wordplay, meandering melodies, propulsive meters and captivating guitar wrangling. La Blogotheque recently captured Barnett in a walkway in Paris performing Depreston (one of our favorites off the album) on a Take Away Show. Check it out below. Barnett plays two sold-out shows at The Roxy in LA this weekend, but there are still tickets available for other shows to be found HERE. Little Wings has just dropped its outstanding new album Explains on new label Woodsist. We’ve been huge fans of this under-appreciated ensemble for well over a decade and were thrilled to learn of the new release. After non-stop, repeat listens, we believe this to be amongst the band’s best albums to date (extremely high praise given their prior output and Wonderue in particular). 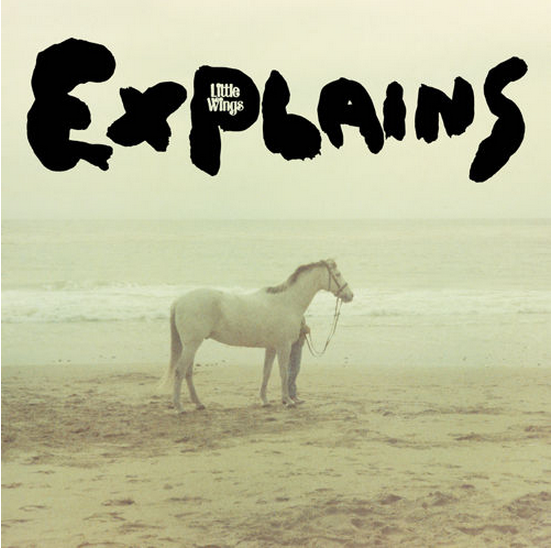 To our ears, Explains contains some of the band’s most melodic and accessible (in a blessedly off-kilter way) songs to date, and all without losing leader Kyle Field’s unique wordplay and world-vantage. In short, Explains is amongst our favorite albums of the year thus far and has survived repeated listens phenomenally well. Check out the tremendous opening track By Now below, and go HERE to buy this superb new outing from Little Wings. Afterwards, check out our email interview with Kyle Field in between live performances, others’ recording sessions, and a foray to Japan. Lefort: Your last album’s title (Last) was a bit foreboding and, like many of your fans, we were concerned that it might indeed be your last. But then news of the new “Explains” hit and the concern was annulled. Is it fair to say, as alluded to on the new album, that you’ve determined/resigned-yourself to keep laying those “golden eggs” for your friends and fans? Lefort: Having had the new album on repeat for weeks and still loving it, where do you see it falling? How does it differ in your mind, if at all, compared to your other albums? KF: I have no idea…. I don’t compare my albums to each other. In a sense I am focusing on the new songs that aren’t recorded yet and that leaves me very little time for bean counting. [The album] survived the mixing/mastering phase in my ears and that says a lot because you end up hearing it so many times and picking apart every moment. If I was forced to compare, I would say that it has more rhythmic drive and push than most of the others thanks to Zeb Zaitz and Tommy McDonald’s ears and natural style. Lefort: Which of the songs on the new album are you most proud? KF: I celebrate them all. I enjoy the sequence and how the record works beginning to end. Lefort: Thematically, the album seems to ask big questions and to be an assessment of your life and work. With questions about growing older, higher beings, the vagabond vs. conventional–life, solo vs. relational life, what was the backdrop and context for the creation of “Explain”? KF: It started as an idea for a list, like: “Little Wings explains: a blade of grass, this evening, etc.” So it was like a lecture about the world or something near to it. It bled out from there, taking on subtler angles and themes arriving at “Little Wings explains Fat Chance.” Explaining what I have learned by now. Lefort: With respect to your last album, LAST, you said: “Lots of things I feel and inject into the experience I realize are just for me and me alone as guidelines and motivations.” What aspects of the new album fall into that category? KF: I think this one is more open and generous in a sense; not subduing the keyboard sounds and less hiding perhaps. Lefort: What portion of your songwriting is “spontaneous inspiration” versus painstaking attention to crafting a song? KF: Besides a few band-aids (word overdubs), the lyrics for the first song By Now were completely improvised. I was basically serenading Tommy McDonald (The Range of Light Wilderness) who was pressing “record” in his living room where we did a lot of the secondary overdubs of the album. I don’t feel “painstaking” could really apply because if i get a good idea for a song, it feels like a puzzle to solve and the process is different each time. I don’t tend to force myself to write very often. Lefort: When and where was the new album recorded, who were the players and who produced? How was the process for you? 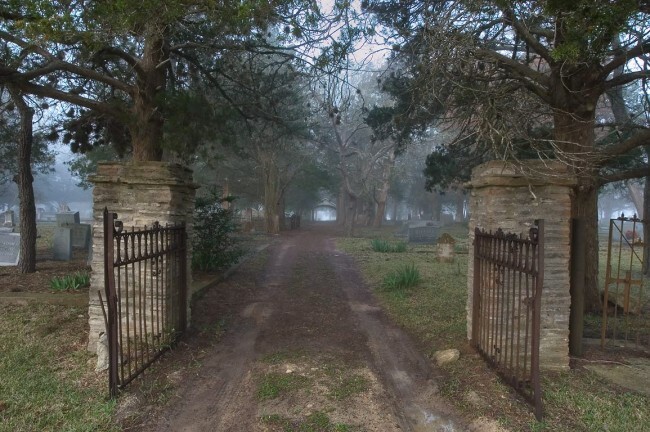 KF: The initial song-beds for the new album were recorded at a house near Morro Bay where drummer/pianist Zeb Zaitz (Sparrow’s Gate) lives by John Baccigaluppi (Tape Op, The Hangar) with whom I recorded LAST. Additional layering was added a few weeks later at a house in Big Sur where bassist/keyboardist Tommy McDonald lives. I sometimes have a funny relationship with the word “produced” as I figure anyone who added to it helped. But I guess I would say it was produced by John, Tommy, me and Kyle Mullarky (who I mixed the album with at his home studio in Topanga Canyon). Paul Dutton added some great guitar overdubbing, and sounds. Lee Baggett layered guitars and a few vocals. Fletcher Tucker (Gnome Life, Bird by Snow) put on some dulcimer, bowed dulcimer,and keyboard parts. Tommy and I both put keyboards on it, and Joel Tolbert played slide guitar and accordion, which is very low in the mix. The process was pretty great; we all get along really well, and Tommy and Zeb have been friends of mine for a while, and have been in different versions of the live band over the last two years. Essentially I had put together [Tommy, Zeb and me] as a trio and played a handful of shows and just liked the way we sound and play together and wanted to run new songs through that tube. Lefort: Live and on some tracks on LAST (Neptune’s Next and Knock of Every Door), you performed a couple of songs with quasi-rap elements. We were anticipating some expansion into this realm on the new album. But you seem to have resisted/squashed that vein for now. Any prospects for the future? KF: I feel a lot of rap in the new album, and I have introduced boasting for the first time, which i feel is even more rappy than in the past. 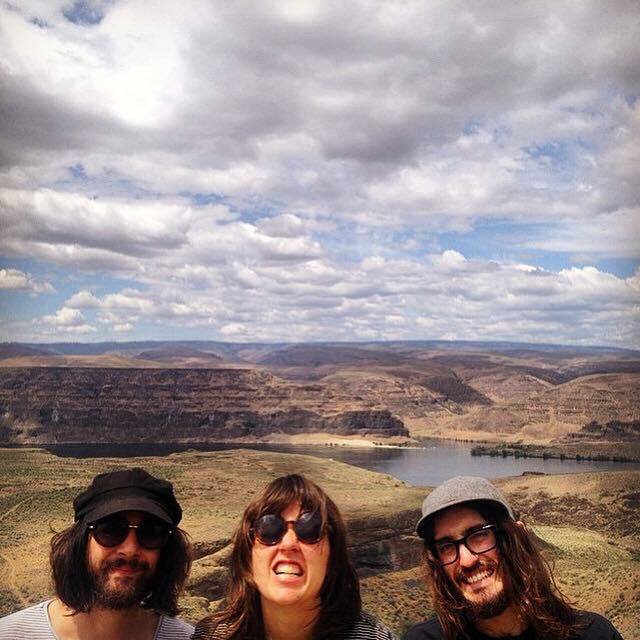 Lefort: Like many, we enjoyed your brief collaborations with Feist a while back. Do you stay in touch and are there any further collaborations contemplated in the future? KF: Thanks. We stay in touch here and there, and who knows? Everyone is busy with new things, but stranger things could happen. Lefort: How did the Woodsist collaboration come to be? KF: I asked Jeremy Earl (Woods) if he would want to put out a Little Wings album, and he said he had been wanting to put one out for years. Mutual admiration i guess. I had been invited to play the Woodsist Festival for two years in a row ,and his interest and support seemed reliable/attractive. I like his label and think it’s a nice fit working together. Lefort: During another musician/artist’s (Joseph Arthur’s) recent tours, he painted canvases on stage while performing songs. Knowing your artistic ways, any possibility of your doing the same (we asked, anticipating a “what-am-i-a-circus-act” response)? KF: I would love to. I have used an overhead projector before and drawn and sang at the same time. I need to hit that note again. Lefort: Out of all your recordings, do you have a favorite album and a favorite song? KF: Not so much. I am usually into my latest song that has just been written, when the paint’s still wet and pre- studio. Lefort: What are you upcoming performance plans? KF: We performed as a big band (seven piece) at the Woodsist Festivals. Now in Japan to play seven solo shows. I used to go to Big Sur in the 90’s and wondered if I would ever get to play music there, and now I play at least two times a year it seems. So no complaints. Lefort: Your lyrics in particular seem at times improvisational and at others painstakingly penned. Is that the case? KF: Yes, I think I go for some sort of juxtaposition/inconsistency in some sense because i think it’s more interesting than a blatantly straightforward narrative. That being said, I rebounded from that thought and began learning more country songs and then re-realized the power of straightforward storytelling. It’s hard to do. This album dabbles in some abstract expressionism that may feel topsy-turvy to some. Lefort: Are there other lyricists/poets that have inspired your own lyrical style? KF: Too many to name, and I am a pretty lame name dropper. But, you know….poets, country singers, divas, and this rapper named “Cold G” from Oakland, CA. Thanks Kyle. We will have a full review of Explains soon come. Bon Iver went on deserved hiatus a few years back following their never-ending world tour in support of their eponymously-dubbed second album. 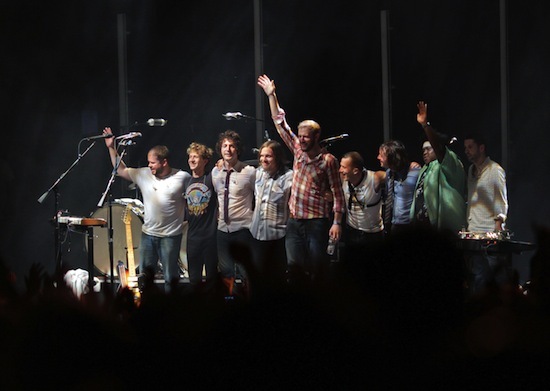 Last week leader Justin Vernon confirmed hiatus interruptus when he announced that the band will return to headline the first annual Eaux Claires Music Festival this July. Vernon went on to say that the appearance is anticipated to be a catalyst for the band’s next cycle. We can’t wait because their 2011 album and 2012 concert at the Santa Barbara Bowl were absolute highlights of those musical years. A day after hearing this good news, we found that Austin City Limits has made its Bon Iver episode available for viewing, but only until June 13th. Do yourselves a favor and watch that segment below before it goes on hiatus. It’s as good as it get. In a word it’s: magnificent. And get ready for the return of the great Bon Iver. Years ago, folk singer John Gorka paid tribute in his song Let Them In by setting in song a poem written during World War II. To those that have served…. We were recently tipped off by a Philadelphia native (thanks Jon) of that city’s indie-punk band, Hop Along, and the otherworldly vocals of its singer, Frances Quinlan. Turns out the tip was spot on. Check out below Quinlan’s powerful, hectoring vocals on their track Waitress off of the band’s break-out album, Painted Shut. If you aren’t seriously impressed when you hit the 25th second of Waitress and Quinlan first let’s howl with “just” her heart, then we fear for your musical soul. Her vocal reminds us of that day in 1991 when we drove onto the Bay Bridge and first heard Kurt Cobain’s ground-breaking vocals on Smells Like Teen Spirit and immediately scrambled (pre-Shazam, y’all) to discern the name behind the voice. Yes, Quinlan is THAT good on this song. Check Waitress out below and pick up Painted Shut (now on Saddle Creek). The song’s lyrics are at bottom. 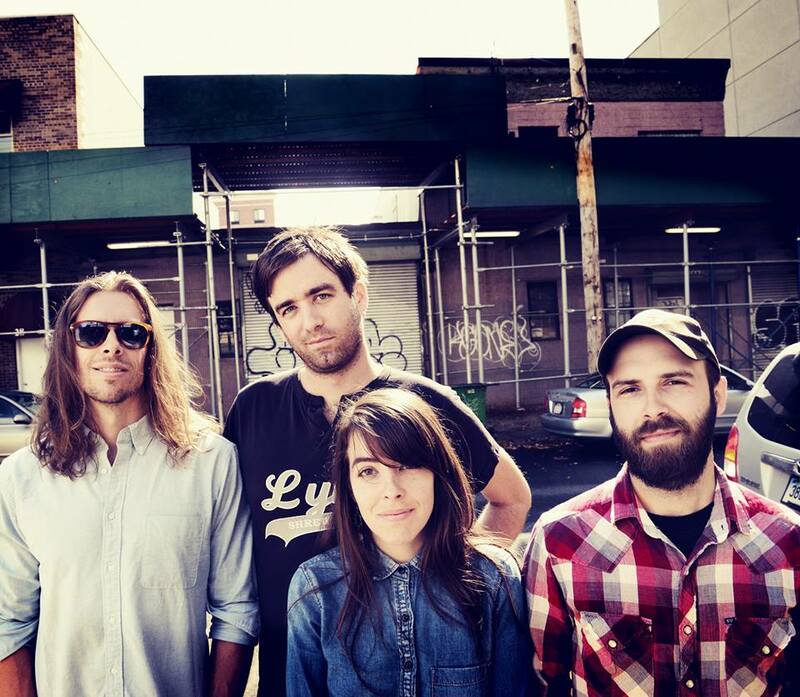 We’ll have more on Hop Along soon come. Ever make a mistake? Twice? Apparently Pavlov was wrong. We once again took leave of our minds and lost track of Ireland’s Villagers. Thanks to a new album (Darling Arithmetic on Domino Records) and La Blogotheque’s Take Away Shows below featuring songwriter-leader Conor J. O’Brien, this memory-lapse has been corrected. Again. Check out the beauty found in these lyrics expressed so well in a church, the perfect reverberating backdrop for O’Brien as he performs Hot Scary Summer (worthy lyrics at very bottom) off of the new album. Afterwards, watch O’Brien performing Everything I Am Is Yours acoustic with accompanying harpist. 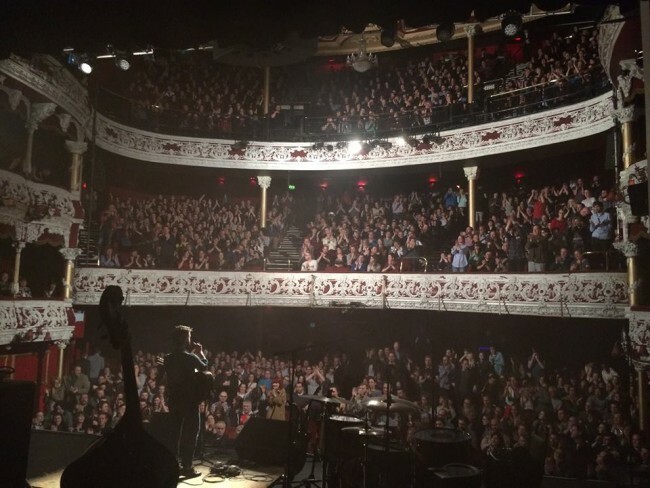 And finally, watch O’Brien accompanying Ala Ni covering Cry Me A River in that same church. Villagers will be coming through California the first week in June and the dates can be found HERE. Now that all the Letterman hoopla is (unfortunately) over, it’s time to get back to some new music. 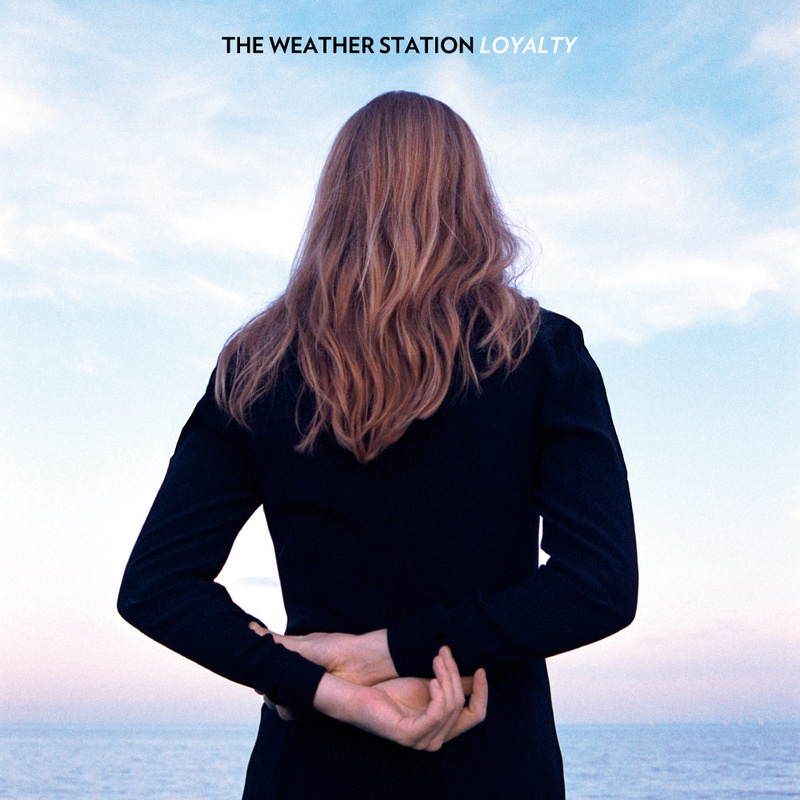 And the music that’s resonating most on this gray, oil-slick California day is Canada’s The Weather Station and the sterling track Tapes off of their new album Loyalty. 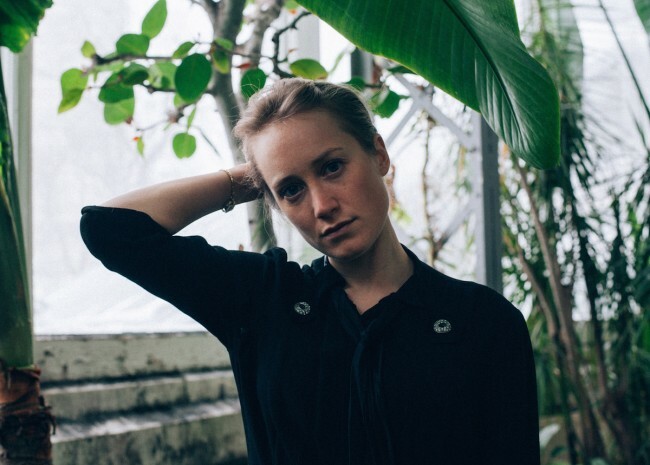 Tamara Lindeman is the Canadian singer-songwriter that is The Weather Station, and she is emblematic of the best of Canada’s female singer-songwriters. On the intimate Tapes below Lindeman manages to channel the Canadian greats Joni Mitchell, Mary Margaret O’Hara, and Kathleen Edwards all in one heart-breaking, haiku-like, cautionary lament. Cautionary in the sense that we, like many, have got some tapes laying around that no one may ever hear. Check Tapes out below. The song’s lyrics are at bottom, though the singer’s mournful vocals convey as much or more. We’ll have more on The Weather Station and the critically-acclaimed Loyalty soon. Loyalty was recorded in France with Bahamas’ multi-talented Afie Jurvanen and engineer Robbie Lackritz (Bahamas, Feist). In short: we concur completely with the acclaim of those critics. Well here’s something you haven’t seen on The Lefort Report: the Foo Fighters. Nothing against the Foos, but they seem to be doing alright without any coverage by this humble rag. 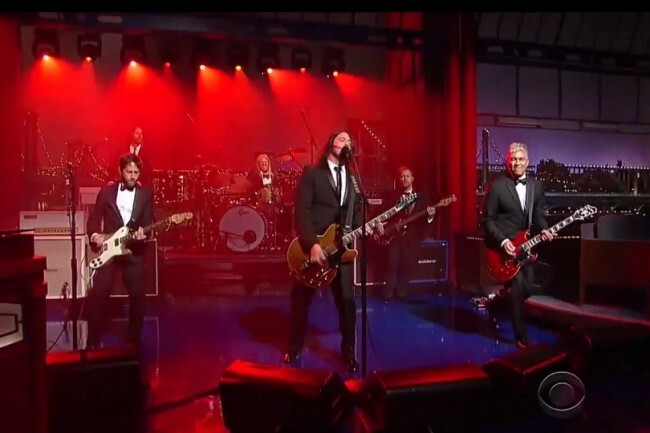 In honor, however, of the great David Letterman and his favorite band and song, check out below the Foo Fighters performing their song Everlong last night as the culmination of the last episode of the Late Show with David Letterman. We will say this about the Foos (in addition to Dave Grohl’s huge-heartedness): Taylor Hawkins shreds on drums. Wow. Check it out. So sorry to see you go Dave Letterman. An era ends, but happy trails to one of the greatest entertainers to ever live. Whoa…it’s been a crazy-busy time with all sorts of stuff goin’ down. Chief amongst the “entertainment stuff” going down is David Letterman’s retirement after tonight’s last show of his 30+ year rein. Dave’s had a gaggle of great guests on the past few weeks in particular (the high point being the inimitable Tom Waits last week). And all the while the other talk show host have been paying tribute to Dave (Jimmy Kimmel’s choked-up tribute last night was sweet) and plying their wares. 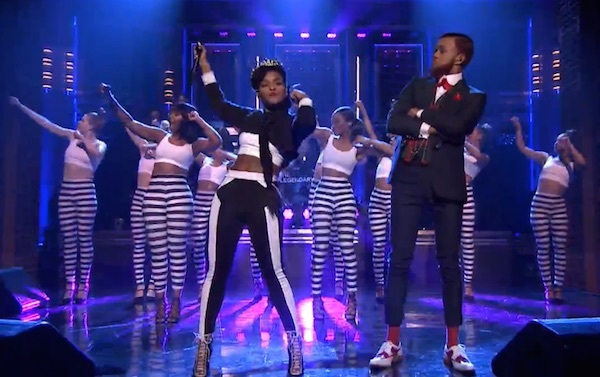 For example, on Monday night Jimmy Fallon had on the highly entertaining Janelle Monae. We’ve been touting Monae since 2010 so it’s great to see her finally getting her due and scoring big. On Fallon, with superb support from The Roots and her pal Jidenna, she simply took over the studio and scintillated with her new track Yoga. The song is as catchy as SARS and, to our ears, takes a page out of M.I.A.’s estimable songbook. Check it out and if you want more, watch her desk-stomping performance on the Letterman Show in 2013 HERE. After the Fallon vignette, check out the official video for Yoga.